I am shipping out the first batch of coupons this week! You may have seen my post I’m Clipping Coupons, Want To Join Me? about how the military personnel and their families can use expired coupons overseas. There is a program called Troupons which involves collecting and sending MANUFACTURERS COUPONS overseas so that people in the military and their families can use them to help stretch their dollars. 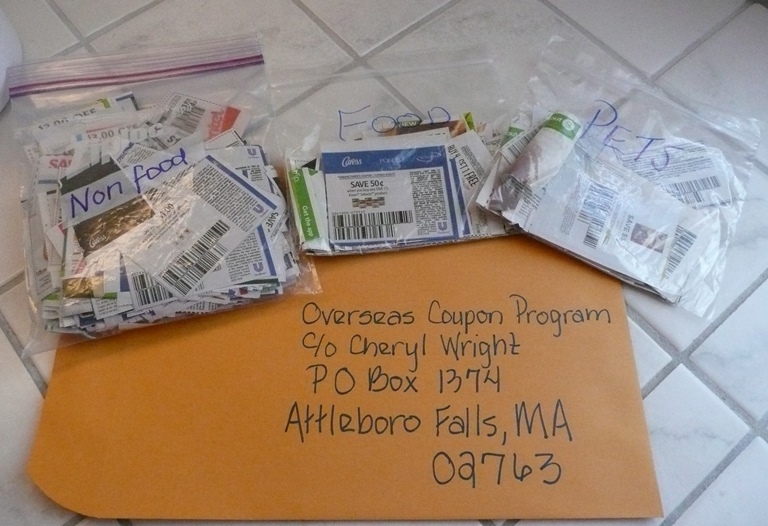 I learned about it when I came across Cheryl Wright’s post Overseas Military Coupon Program. She has kindly offered to accept coupons then forward them on to the Troupons program. Because, if you don’t know, cutting out coupons takes a long time. First you have to make sure they are the correct coupons (MANUFACTURERS COUPONS) then you have to cut them out. Then separate them into the correct categories, then separate them into expiration date piles. Originally when I posted my post saying I was going to send her coupons, I didn’t have that many. I don’t get many coupons. I don’t get the newspaper and that is where the bulk of MANUFACTURERS COUPONS come from. But I realized that there are a few Nia and yoga students that actually get a newspaper and they would have access to coupons. So I asked my students for help collecting coupons to help people in the military overseas. My students came through. They are helping by cutting out coupons. They have brought me enough that I can sent a batch off to Cheryl. I have separated them into three categories: Non-food, food, and pets. I am going to leave the expiration date sorting to her because she will have a better idea of when the coupons will get to the program. At this time most of the coupons are NOT expired, but by the time they get overseas they will be, but hopefully they will be in the acceptable time frame. I am so grateful for my students contributions. I really wouldn’t have had enough to send to feel like I was contributing, but with their help I think we are making a worthwhile contribution. The non-food coupons make up the bulk of the coupons. I am sure that there are plenty of uses for many of them. There are coupons for hair dye, shavers, allergy medicine, probiotics (in many forms), heart burn medicine, and more. I am just fascinated by this whole program. I love that coupons can help the military overseas. I think that is amazing. I appreciate the people that work to make this happen. So thank you to my students. Thanks for taking the time to cut out the coupons and bring them to class. Thanks to Cheryl for volunteering to get the coupons to the program. And thanks to the program organizers for doing it all. I think that cutting out coupons and sending them in is an easy way to help out those that are making sacrifices for us. If you are interested in learning more about the Troupons program click here. If you are interested in sending your coupons to Cheryl click here.